I just got this email from Demand Progress, and I thought you should know about it: It highlights an upcoming Supreme Court case that will affect all of us, especially people who sell things online. We’ve told you about the crazy Supreme Court case that could make it illegal for you to sell the things that you own. Well, the court hearing is set for this Monday, October 29th — and we need you to join us in a day of online activism. If we lose this fight, practically anybody who wants to resell products they bought — from Macbooks and iPhones to our clothing and textbooks — will have to ask copyright holders for permission first. And they’ll have the right to deny it! The forces that lined up in support of SOPA — Hollywood, the recording industry, and other huge corporations — are urging the Court to rule against consumers. So we’re going to fight back — just like during the SOPA fight — by using our websites to sound the alarm. Please click here to sign up to take part! Remarkably few people have even heard about this case, and it’s time for us to change that. Win or lose at the Supreme Court, we expect to have a legislative fight about this issue on our hands by January, and we need to push people to contact their members of Congress before Big Business gets them to side against us. So we’ve built a variety of ribbons and ball-and-chain icons that you can put on your site on Monday to help make sure the whole world knows about this horrendous case. You can view them all here, and sign up to use your site for activism on Monday — we really need your help. Participation from a few hundred sites — or even a few dozen — is almost certain to get the media’s attention as they cover the Supreme Court hearing. Everybody is welcome to join in the day of action, but your friends who sell things online will probably be especially interested. Whether they use Craigslist, Ebay, Etsy, or just a personal site or a blog, they’ll want to know that their right to keep selling could be in grave jeopardy. Will you forward them this email and/or use these links to make sure they know about this lawsuit? If you’re already on Twitter, click here to tweet about the campaign. One last thing — Demand Progress’s small, dedicated, under-paid staff relies on the generosity of members like you to support our work. Will you click here to chip in $5 or $10? Or you can become a Demand Progress monthly sustainer by clicking here. Thank you! The real winner of Tuesday’s presidential debate? Young voters. Unlike the first presidential debate and the vice-presidential face-off, issues that impact young Americans played a much more prominent role last night. The town hall debate, moderated by CNN’s Candy Crowley at Hofstra University in Long Island, New York, gave Americans the chance to ask the candidates about their policies directly, including three young Americans who asked about immigration, equal pay for women, and job creation. While some of the responses weren’t very clear, these questions did highlight the contrasts between President Obama and Gov. Mitt Romney on youth issues. And while these issues had a good chunk of the spotlight, some responses don’t paint a pretty picture for young Americans. Jeremy Epstein, a junior at Adelphi University, asked Gov. Romney about his future job prospects as a college student who will graduate in 2014. Romney responded by saying he would seek to make college more affordable and ensure students like Epstein had jobs when they graduated. “I want to make sure we keep our Pell Grant program growing,” said Romney, who also touted a merit scholarship he instituted as governor of Massachusetts that waives tuition at the state’s public colleges for students who achieve high scores on a standardized test. But this commitment to Pell Grants has been missing on the campaign trail—in fact, he’s said that he believes federal aid is partly to blame for higher tuition costs. Indeed, in September Romney appeared on Univision and tried to disassociate himself from the budget plan put forth by his running-mate, Rep. Paul Ryan (R-Wis.), which he’d previous supported. The Romney-Ryan budget would eliminate Pell Grants completely for 1 million students, shrink the eligibility pool, and freeze the maximum award for a decade. Millions of students would see about $1,500 less in Pell aid. In April, when talking to students at Oberlin University in Ohio, Gov. Romney suggested that young people should “borrow money … from your parents” to attend college or start a business, just like his friend Jimmy, the founder of sandwich chain Jimmy Johns who borrowed $20,000 from his parents to start his business. But what Romney didn’t acknowledge is that most young Americans don’t have parents with thousands in disposable capitol to hand over to their kids. But just two weeks ago at the first debate, Romney said he would not “cut grants that go to people going to college.” While Romney continued to provide vague details on how he’d ensure higher education is accessible and affordable, President Obama touted a list of what his administration has done to protect and expand Pell funding, restructure the student loan process to save students money, and keep interest rates low. While Gov. Romney tried to back away from his previous statements in which he backed anti-immigration policies like Arizona’s mostly unconstitutional anti-immigrant law, S.B. 1070, President Obama held his feet to the fire. Romney said his previous endorsement of a “self-deportation” policy was a way to “let people make their own choice,” but in reality it implies that a Romney administration would make the lives of undocumented immigrants so harsh that they would be forced to “self-deport” back to their country of origin. I want to make sure we understand something. Governor Romney said he wasn’t referring to as Arizona a model for the nation. His top advisor is the one who designed the whole Arizona program, not just E-verify. It’s a bad policy and it won’t help us grow. Look, when we think about immigration, we have to understand, there are folks all around the world who still see America as the land of promise, and they provide us energy and they provide us innovation, and they start companies like Intel and Google, and we want to encourage that. Now, we’ve got to make sure that we do it in a smart way, in a comprehensive way, and we make the legal system better. But when we make this into a divisive political issue and when we don’t have bipartisan support — I can deliver, governor, a whole bunch of Democrats to get comprehensive immigration reform done. Romney also said he’d advocate for creating a pathway to permanent residency (but not citizenship) for undocumented youth, many of whom were brought to the United States through no fault of their own, if they served in the military. But Romney conveniently left out any mention of those young, undocumented immigrants who are pursuing a college degree. When a young woman asked Gov. Romney how he would work to close the gender wage gap—women still earn 77 cents to the man’s dollar—the candidate avoided discussing any solutions to the issue and instead lied about how he used an affirmative action-style approach to diversify his cabinet as governor. And this is one of the reasons why one of the first — the first bill I signed was something called the Lilly Ledbetter bill. And it was named after this amazing woman who had been doing the same job as a man for years, found out that she was getting paid less, and the Supreme Court said that she couldn’t bring suit because she should have found out about it earlier, when she had no way of finding out about it. So we fixed that. And that’s an example of the kind of advocacy that we need because women are increasingly the breadwinners in the family. This is not just a women’s issue. This is a family issue. This is a middle-class issue. And that’s why we’ve got to fight for it…I’ve got two daughters and I want to make sure that they have the same opportunities that anybody’s sons have. But a whopping 80 percent of Millennials agree that “government investments in education, infrastructure, and science are necessary to ensure America’s long-term economic growth,” compared to just 6 percent who disagree, according to a report from the Center for American Progress, our parent organization. Gov. Romney said he did not support codifying into law any new regulations on gun control. But gosh to tell our kids that before they have babies, they ought to think about getting married to someone, that’s a great idea. Because if there’s a two parent family, the prospect of living in poverty goes down dramatically. The opportunities that the child will — will be able to achieve increase dramatically. So we can make changes in the way our culture works to help bring people away from violence and give them opportunity, and bring them in the American system. The opinion pages and airwaves are already overflowing with back-and-forth between pundits about who won the debate, but one thing’s for sure: Young people had the chance Tuesday night to hear President Obama and Gov. Romney speak directly on the issues they care about, and that is a real victory. The nation is standing with Big Bird. Now it’s your turn. Here at Free Press we don’t take positions on elections, but we do fight for public media — and we have for almost a decade. Stand with Big Bird. 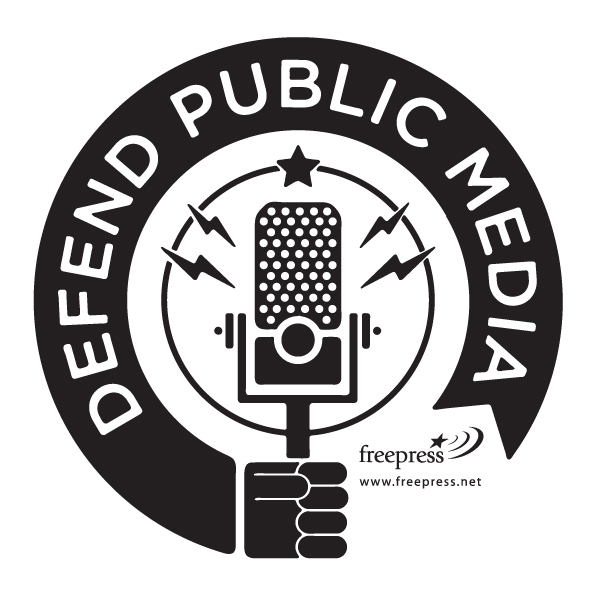 Click here to get your FREE Defend Public Media sticker. This isn’t just about Big Bird. It’s about quality journalism, arts programming, educational shows — all that we’ve come to expect from PBS. And it isn’t about one party or the other. The majority of Americans, across the political spectrum, support federal funding for PBS. The stickers are a great way to raise awareness about the need to protect public media funding. And we have big plans to make sure the public is heard in debates about public broadcasting — no matter who our next president is. We’re in this for the long haul. Get your FREE Defend Public Media sticker and stay tuned — we’ll be in touch soon with more ways to show your support for public media. The Free Press Action Fund does not endorse or oppose any candidates for public office. The Free Press Action Fund is a nonpartisan organization building a nationwide movement for media that serve the public interest. The Free Press Action Fund does not support or oppose any candidate for public office. Learn more at www.freepress.net.